All Party Parliamentary Save the Pub Group, originally uploaded by J Mark Dodds a shadow of my future self. What's happened to trade industry news reporting about the Tied Pub Sector? The answer is NOTHING HAS HAPPENED. The Tied Pub Sector is NOT Being Reported. It's a COP OUT! The pub trade's official 'most loved by publicans' news reporting organ, the PMA (Publican's Morning Advertiser) has published NOT ONE WORD about the pasting that British Beer and Pub Association and Enterprise Inns took in Committee Room 7 at the House of Commons on 5 December last week when questioned about the improvements the tied pubco's have made since being put in the 'Last chance Saloon, several years ago by Select Committee number errr, was it 1,2,3 or was it 4 or 4.1 or 4.2. Aha. It was ALL of them. The pubco's have nto changed their behaviour one bit in all the years they have been looked at. They just fiffle faffle with codes of conduct. They are on draft five or the 2008 version now. And the most recent draft offers LESS to lessees than did the 2002 COP. There's nothing, anywhere that I can see covering all tied tenants' Must See event of the season - the most important meeting in the pub sector - the All Party Parliamentary Save the Pub Group's update on where and how the industry Codes of Practice have impacted on the relationship between Tied Tenants and their Pubco and Family Brewer Landlords. 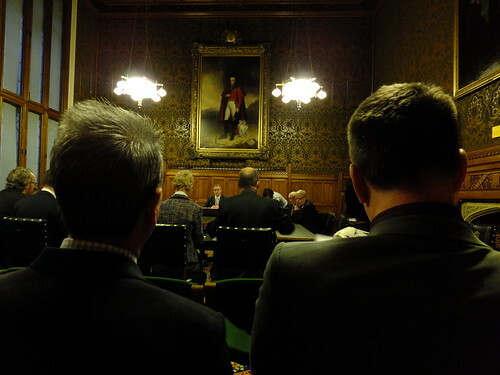 The well attended meeting was in Committee Room 8 of the House of Commons last Wednesday, 5 December chaired by Greg Mulholland - who grilled representatives of IPC, FSB and PAS alongside BBPA boss Brigid Simmonds and Enterprise COO Simon Townsend over "One Year On - Self Regulation in the Tied Pub Sector". The upshot basically is that nothing has happened - zilch zero nada niet nowt nurt nit not nuttin' except the BBPA moved from Draft Five to Draft Six and asked to be given until the middle of 2013 for a chance to see if they can move towards Draft Seven. Yes it was really exciting. I fell asleep until Brigid woke me by raising a shrill voice in objection to something Greg Mulholland asked her. I’d be grateful if you could give me an update on the discussions taking place on the Licensees Supporting Licensees Facebook group that I see you are an administrator of. It has been brought to my attention that there have been some rather conspiratorial and potentially libellous comments on the forum concerning the PMA’s “relationship with Enterprise” – and I’d like to ensure I have an opportunity to address the claims being made. Perhaps you would approve my temporary membership of the group? I'll give it consideration and get back to you soon. BTW – the APPSTP event story is page 1 in the PMA on Thursday and will be the lead story on the website, before too many conspiracies take flight. We thought interested parties might prefer the higher profile of a print/web excusive, rather than running it online first and thus watering down the impact of the magazine story. Our weekly frequency sometimes means it can feel like a long time for a story to break – but that’s the nature of our publishing cycle. We are certainly not, as you have just suggested to Mike Berry “completely ignoring the most pressing and important issues facing the tied pub sector”. And there is no embargo, or deal with pubcos or any such restriction on our freedom to report what we see fit. We do not remove any posts because of their subject matter. We will remove posts (and ultimately bar users) when they misbehave on the forum – for being abusive, or hijacking threads with inappropriate or irrelevant comments – not for their ‘politics’. No one has more freedoms than anyone else, and both sides of the tie debate seem to give as good as they get. But if people can’t make their point without getting into unseemly slanging matches and personal comments, then they have no place on what is meant to be a sensible business forum discussing a wide range of pub industry topics. Please stop hijacking threads on the PMA forum with posts about pubco-tenant self-regulation. It’s wasting both your time and mine. If you want to post on the forum, then please stay on the thread topic. I believe Rob Willock has just emailed you regarding the current state of the play. The story that you are demanding to see will be published on Thursday. If you were not completely ignoring the most pressing and important issues facing the tied pub sector you'd find people less likely to be stimulated to post cheeky 'hijacks' on 'unrelated' topics. Pausing for thought, it's difficult to imagine anyone being able to post on 'related' threads when there are no threads even obliquely related to post on because your publication seems to have adopted a policy of not reporting on the tied sector. From your position as a reporter it may not be obvious - as it is to people like me whose lives have been subsumed by the oppressive weight of the tied pub sector for decades - but the reality is that no matter what the subject matter when dealing with pubs, there's always something tied sector related, because the impact of the tie is utterly pervasive across the whole of the pub industry, from top to bottom, inside and out, from shop floor to retail prices and free of tie rents, everything is tainted by the pernicious influence of the tie. There is nothing that is not affected by the meddling of the pubcos and the BBPA across the entire sector as it's been asset stripped comprehensively since the beer orders. If you disagree, please point me to the clear sky I am blind to. From the outside it is obvious that an embargo has been clapped on PMA on reporting anything critical of pubcos or anything tie related. Perhaps you can confirm or, if you refute this, explain why you remove posts that are against the tied line, when they are not libellous in any way, and why your publication appears to have entirely stopped covering contentious issues in the tied sector? Thanks Jude, took a while to wait for a response, which was that Rob Willock banned me from the forum.